Summary: Alicia Richards loved her daughter from her very first breath. Days later, when tests confirmed what Alicia already knew—that Chloe had Down syndrome—she didn’t falter. Her ex-husband wanted a child who would grow to be a scholar. For Alicia, it’s enough that Chloe just is. Alicia strives to see past her misgivings to the new possibilities opening up for her daughter. Shouldn’t Chloe have the same right to love as anyone else? But there is no way to prepare for the relationship unfolding, or for the moments of heartbreak and joy ahead. 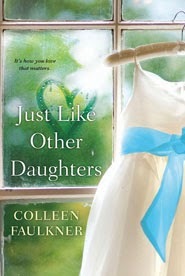 I could be totally shallow and admit that one of the reasons that I picked up JUST LIKE OTHER DAUGHTERS by Colleen Faulkner was the cover. (Doesn't it just look like it belongs on Target's shelves?) However, it didn't take me long to realize that this novel also had some substance to it... and by that, I mean it dealt with some very difficult (and even uncomfortable) situations. When Chloe meets a young man named Thomas at her adult daycare center, she is immediately enamored by him; and it appears that Thomas feels the same way. They decide that they want to get married, and Thomas's mother fully supports them. Naturally, Alicia has her concerns but she decides that her daughter has a right to be happy just like any other young woman. Alicia agrees that Chloe and Thomas can live with her; however, things become hard for the young couple pretty quickly. While Alicia knew there would be challenges in taking care of two mentally challenged adults, she had no idea just how complicated things could get. Overall, I enjoyed JUST LIKE OTHER DAUGHTERS, and I especially liked how much it made me think. That's always a sign of a good book to me if I think about it even when I'm not reading it. JUST LIKE OTHER DAUGHTERS had interesting characters in Alicia and Chloe, and it also brought forth many ethical questions about parenting an adult with Down's syndrome. I also liked that while parts of the story were predictable, the story did have some twists and the ending wasn't wrapped up nicely with a big, fat bow. In addition, I liked how Ms. Faulker decided to tell this story. She wrote both Alicia and Chloe's version of the story in their words. I commend her for tackling Chloe's portion because I suspect it was difficult to capture the voice of a young woman with Down's. However, I admit that I enjoyed Alicia's sections much more. I appreciated how well developed Alicia was, and I liked the honestly that was conveyed in her character. I don't have a lot experience with mentally challenged adults (or kids for that matter), but I feel as if Ms. Faulkner offered a realistic portrayal of many situations. What I really appreciated was the look she gave me into not only the day-to-day issues, but many of the ethical concerns a parent could have. All I can say is "Wow!" And I certainly have an even greater appreciation of these parents. JUST LIKE OTHER DAUGHTERS would make an ideal book club selection. The book deals with so many wonderful issues about mothers and daughters. Plus there are many ethical issues to debate. The publisher posted a reading guide which explores some of the topics including love, intimacy, relationships, marriage, grief, and guilt. JUST LIKE OTHER DAUGHTERS is a thought-provoking read. Recommended to fans of women's fiction. This sounds interesting and thought provoking. Raising a child with developmental issues has got to be quite challenging. I echo what Kathy said! Wow -- sounds like this hits on some pretty tough issues. I would have picked this up for that cover, too! Its kind of surprising that no one has written a novel like this before. I definitely want to read this one. I love your website, too-- Like all writers, I'm an avid reader.